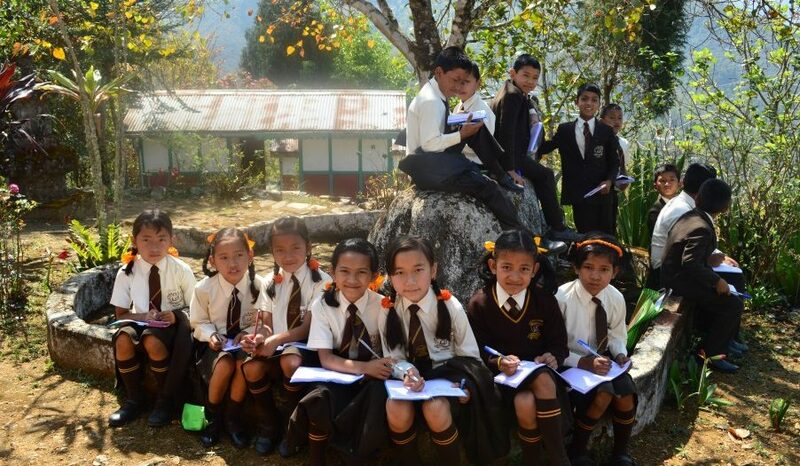 Read about Jayanti’s impressions of teaching as a volunteer at Lovebuds School near Kalimpong. If you’ve missed it, catch up on Part 1 of her story. What struck me against this modest backdrop was the wonderful spirit of the children – they brimmed with vitality and enthusiasm for learning and were so rewardingly responsive. This along with the courtesy and good manners they showed made teaching them hugely pleasurable and more than made up for the lack of any sophisticated equipment. To me it was clear that the 3 Rs of learning and teaching were working. The children have surprisingly high levels of literacy in English, a non-native language. They seemed extremely well trained in getting down to classwork using their textbooks with their full attention and concentration and engaged equally readily with EFL communicative activities, interactively reacting and shouting out their answers – they all wanted to be right and when they guessed a correct answer the joy they expressed was a joy to behold. They were happy to work in pairs and to discover that working together was an enjoyable and productive alternative to competitively working against their neighbours – they would instinctively and touchingly curve their arms around their work to shield it from prying eyes from another. This habit presumably stems from the severe ranking system endemic in the country’s education system. Of course their English may not have been perfect and they still have some way to go. I would describe their English as being fluent but not perfect or native-level as yet. One frequent mistake was in subject-verb agreement – I frequently heard them say “they goes” rather than “they go”. However, their accuracy and fluency is bound to improve given the right academic opportunities – something I witnessed from a pHD student I met from Munsong who had attended the same school! Where resources matter here is having enough books to form a decent library system and having qualified or trained teachers who themselves have a good command of English. The teachers did attend a training session, given by a native English speaker which they found useful, I think, and responded to really well. However, whether this one-off training (which introduced more up-to-date ideas such as various methods of error-correction) would be incorporated into teachers’ daily practice in the long term was questionable – if only because more traditional methods were rather ingrained and proved to be all to easy to revert to in the absence of more frequent sessions and on-going support in the absence of formal teaching qualifications. Since I have been out there, Mondo have put together a full training schedule for teachers to embed better teaching practices. The disadvantage of the lack of teaching qualifications and training was exemplified in one English comprehension exercise done in a Standard VI lesson taken by one of the staff. Looking over their work in my lesson I found that everyone had the same answer repeated word for word, which had been dictated to them by their teacher. The answer itself was quite off the mark, and expressed in flowery language (perhaps in order to mask the teacher’s own incomprehension?). But when I suggested that the answer could be tackled differently the teacher understood very quickly what I meant and went back to the class with a newer version!